This work proposes a new scheme for enhancing fluid animation with controllable turbulence. An existing fluid simulation from ordinary fluid solvers is fluctuated by turbulent variation modeled as a random process of forcing. The variation is precomputed as a sequence of solenoidal noise vector fields directly in the spectral domain, which is fast and easy to implement. The spectral generation enables flexible vortex scale and spectrum control following a user prescribed energy spectrum, e.g. Kolmogorov's cascade theory, so that the fields provide fluctuations in subgrid scales and/or in preferred large octaves. 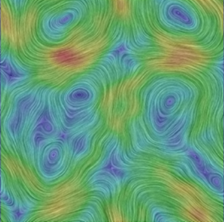 The vector fields are employed as turbulence forces to agitate the existing flow, where they act as a stimulus of turbulence inside the framework of the Navier-Stokes equations, leading to natural integration and temporal consistency. The scheme also facilitates adaptive turbulent enhancement steered by various physical or user-defined properties, such as strain rate, vorticity, distance to objects and scalar density, in critical local regions. Furthermore, an important feature of turbulent fluid, intermittency, is created by applying turbulence control during randomly selected temporal periods. Random vector fields generated for a preferred scale with differen deviations. Divergence-free vector fields with two octaves showing blended rotational behaviors from the two scales. Turbulent agitation from the small scale is controlled with different kinetic energy spectrum distributions. Data flow of our forced fluid simulation. A sequence of precomputed solenoidal fields (ST) work as random forces (f) in a forced fluid solver (FNS) to introduce turbulence. The results (U) of large-scale simulations (NS) are combined with the feedback of FNS results, in order to direct the simulation to follow large-scale flows.